The kitchen is the biggest source of waste in most households. Without proper waste management, kitchen scrap containers can consume space, time, and money. Reducing garbage is a family effort that helps not only in keeping the kitchen clean and hygienic, but also in minimizing bigger community concerns related to greenhouse gases and waste collection. One of the most effective suggestions is to use cloth instead of plastic bags or paper when purchasing groceries from the market. This small act greatly minimizes the amount of waste that you bring to your home. It also helps to purchase by bulks instead of buying in smaller portions. This does not only generally save money and help your budget; it also minimizes the mound of packaging and wrappers that you have to throw afterwards. Opt for the bulk section and store your rice, spices, and other dry foods in plastic containers or airtight glasses. Solid waste management has become a worldwide concern that it is important for each individual to participate in minimizing garbage disposal. In fact, an urban citizen is estimated to produce about 700 grams of solid waste per day. According to studies, more than half of what is thoughtlessly thrown away is organic. Most of these organic wastes are found in the kitchen. If composted, these scraps can produce healthy top soil that is good for plants. The first step to do this is to segregate the dry from the wet waste. After segregating, recycling and composting these biodegradeables will allow a family of 4 to reduce as much as 100-1,000 Kg of waste in a year. Not only did you keep your kitchen clean and save money on fertilizer. You also did your share in minimizing the amount of waste that goes to landfills. 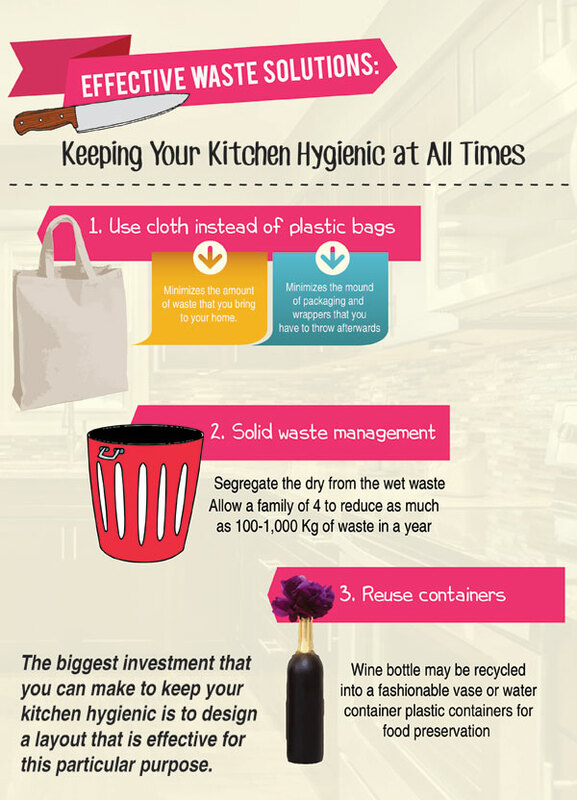 Another fun way of keeping your kitchen hygienic while managing waste production is by reusing containers. An old wine bottle, for example, may be recycled into a fashionable vase or water container. Reusing plastic containers for food preservation is also a better option than just throwing them away after being used once. On the other hand, there are items that cannot be recycled. Used light bulbs, for example, are considered hazardous waste. It is best to minimize the consumption of these kinds of items by investing on long-lasting products. Consider this the next time you purchase a refrigerator or an oven for your kitchen. High quality appliances may come a bit more costly, but think about the amount of money you actually save in the long run. Perhaps the biggest investment that you can make to keep your kitchen hygienic is to design a layout that is effective for this particular purpose. Garbage bins, for example, should be kept near the work place. As for the sink, see to it that there is enough space between the wall and the sink to give room for backsplash. Food particles and water may stick on the tiles or wall and leave residue that breeds bacteria.